When I talk to people about some of the most incredible places I’ve traveled, I usually talk in terms of natural beauty and diversity, incredible food and friendly people. Places that come to mind are Morocco and South Africa. I’m all too quick to discount the place I am living at the moment, which in this case is southern California. But I argue, after living here a couple years, southern California rivals those destinations, particularly in diversity of climate zones, natural beauty and culinary delights. As we drove inland from San Diego earlier this month we kept remarking how the drive from the coast, over the mountains and into the desert reminded us of a drive over the Moroccan Atlas mountains from the Sahara Desert we took several years ago, complete with a blizzard. We don’t think of Morocco in terms of likelihood of snow (though there is plenty, including a ski village). We also don’t think of Southern California and snow, unless you’ve lived here for awhile and are in the know. We weren’t in the know in regards to snow when we arrived in Palm Springs. 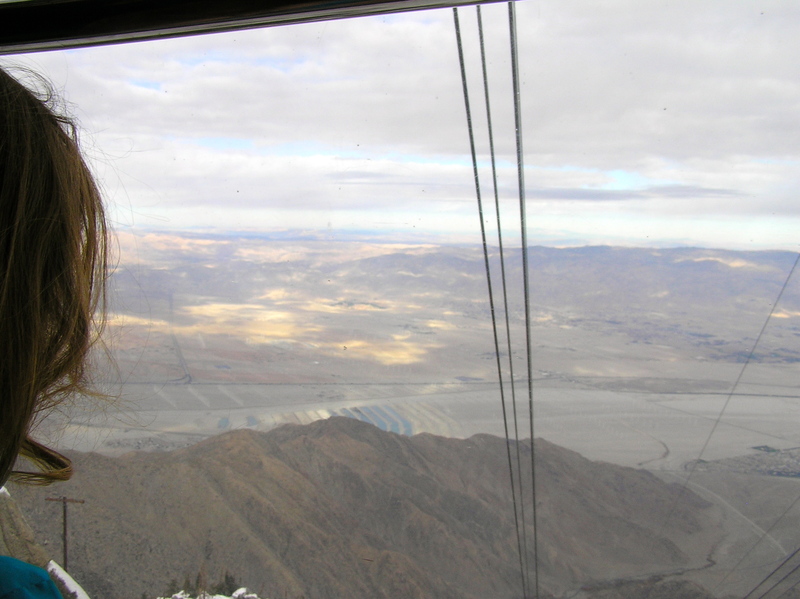 When you’re in Palm Springs, a desert resort town east of Los Angeles, you must ride the tram to the top of the San Jacinto mountain range. Didn’t know that? Now you’re in the know. And if the season is winter, be prepared for lots of snow at the top. 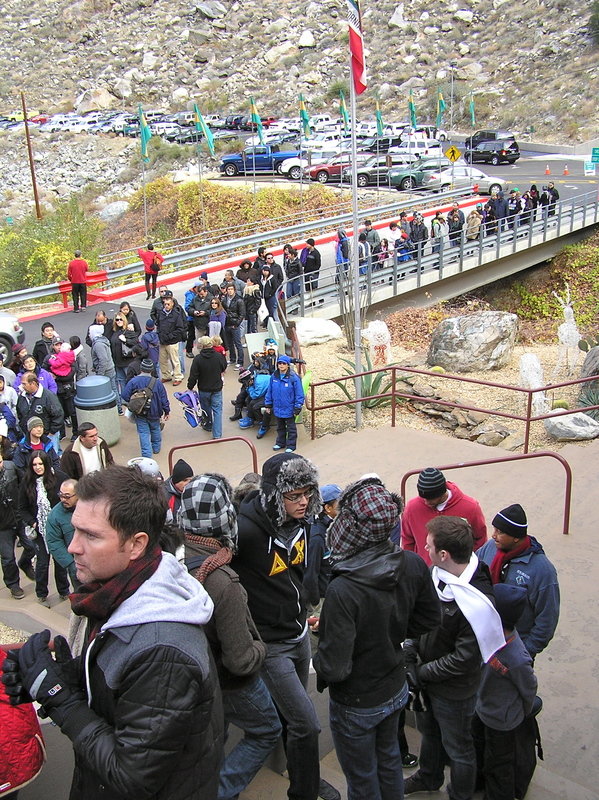 When we waited in line to buy our tickets, we were crammed shoulder to shoulder with people toting snow shoes, sleds, saucers and a variety of other snow related gear. Us? Yeah, we didn’t even bring mittens. The tram ride itself is expensive, pushing $20 a person. 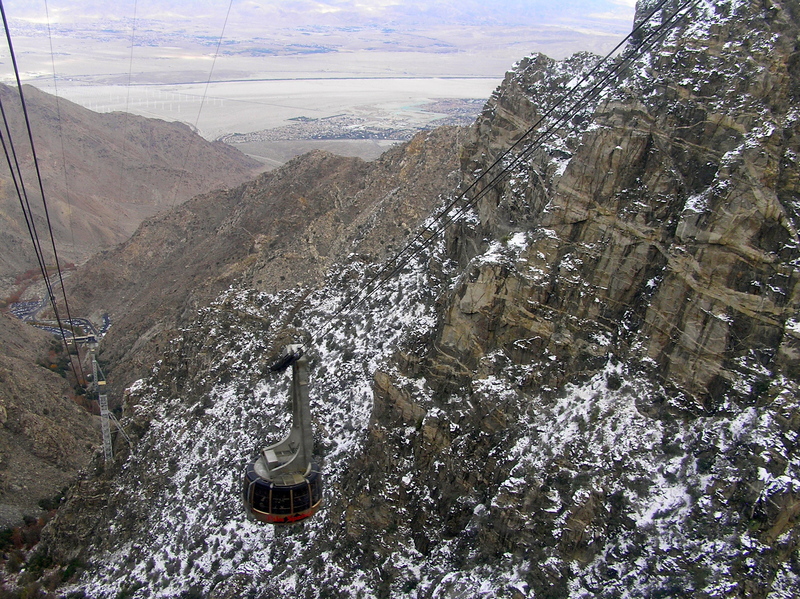 But you pay for the experience of riding the world’s largest rotating tram along two miles of thick cable while ascending 6,000 feet. When you arrive, you understand your ticket has bought you access to an entire mountain range, freeing you to hike, camp, snow shoe, sled or, like us, mostly hang out in the huge ski lodge and sip hot cocoa, enjoying the view of the valley below. When in Palm Springs, this is something you must do. In high season, the line can be ridiculously long. Beware. It takes ten minutes for the tram to ascend. Looking out across the Coachella Valley toward Joshua Tree National Park. 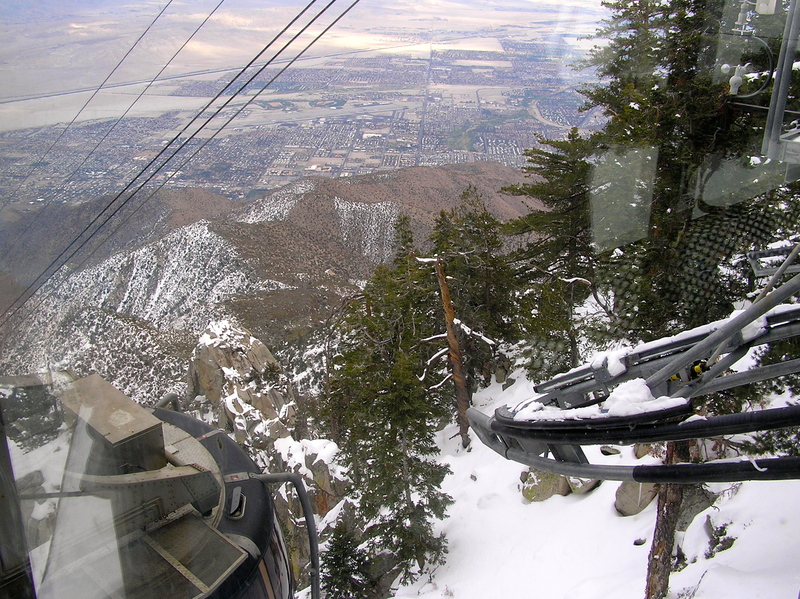 Another tram arriving at the top. 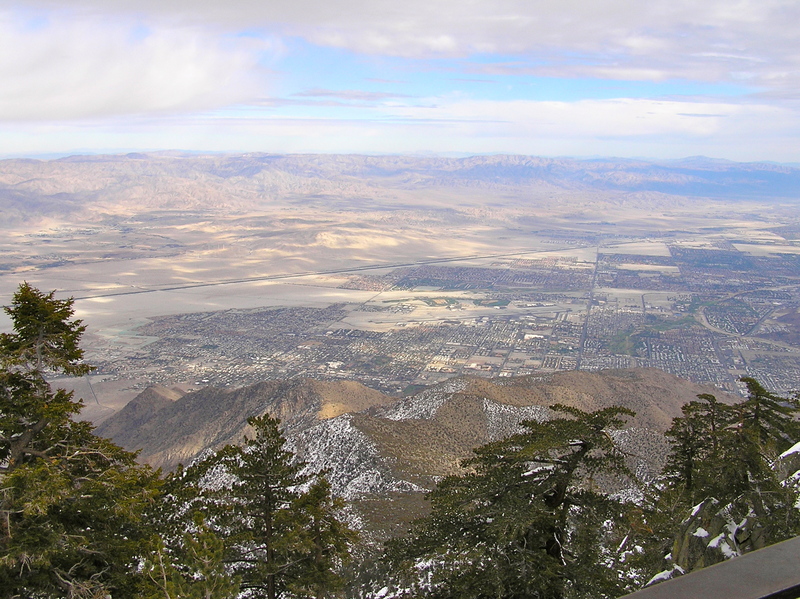 Palm Springs far below. I bet the sunrise from here would be incredible. 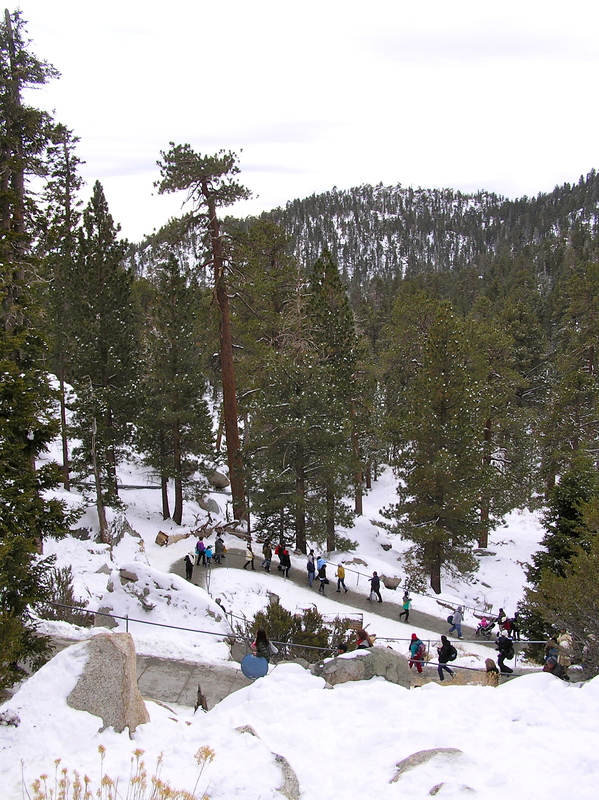 People making their way down from the lodge to the sledding hills. The thirty degree difference in temperature means it stays cool (and snowy) on the mountain long after warmth has arrived in the desert valley below. For more information on the tram, including the fascinating history, visit http://www.pstramway.com. On this trip we also visited the nearby Salton Sea. You can read about that adventure in the related article below.